When I ate at a raw food restaurant for the first time two weeks ago, my dining mates started to look at me funny. “Are you ok, Jennette?” I told them I was fine, but the quietly panicked looks in their eyes suggested I might be wrong about that. I went to the restroom and when I looked in the mirror, I saw a splotchy, red-faced woman. Holy crap! No wonder they were freaking out! Someone dug an antihistamine out of her purse and I was fine, but it probably wasn’t the best introduction to the raw food lifestyle. Regardless of that experience, I decided to take the opportunity to review Raw Food: A Complete Guide to Every Meal of the Day, a book that was recently released in America after its original release in Sweden. After taking a glimpse at the pages and pages of full-color photos, I think I’d still buy the book even if it were still in Swedish. 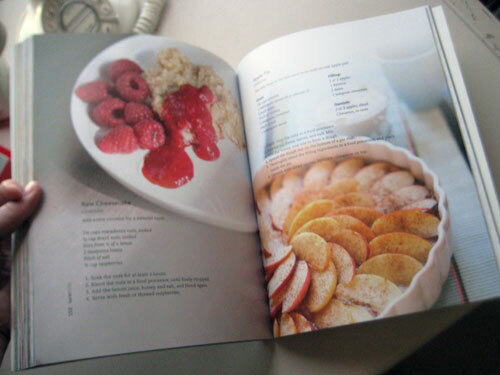 The whole book is like this, beautifully laid out with full-color photos making the recipes look worth all the chopping, sprouting and food processing their preparation entails. Raw food refers to any dish that was made without heating the ingredients to above 104 degrees. Proponents of the raw food lifestyle report that it makes them feel much healthier and more energized. The book encourages you to eat raw your own way, breaking the raw lifestyle into three phases so you can ease yourself into it slowly and to your level of comfort. This is good, because I can’t see myself buying algae at the supermarket. 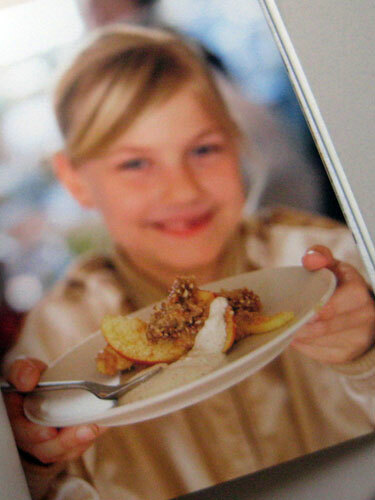 To keep the book accessible to newbies, they purposely did not include any recipes that require a dehydrator. They do list lots of gadgets you can use if you are so inclined, which tempted my gadget-loving soul. They come up with creative uses for some tools, like using a cheese grater to slice radishes or cucumbers, and using a coffee grinder to grind spices. The disadvantages of raw cooking appear to me to be the amount of prep time required to create many of the dishes. If you adopt a raw food lifestyle, a lot of planning seems to be necessary so you have the right fresh ingredients on hand to work with. The authors also mention that you can grow your own sprouts and soak nuts in advance, though if I tried that I’m afraid the cats might enjoy it more than me. The authors also warn that some people develop headaches and fatigue when switching to the raw lifestyle, though the effects are usually temporary and lead to increased energy later. After reading about the raw food lifestyle, I felt like I’d traveled through an exotic foreign land. I doubt I have the patience to adopt the diet myself, but I will probably try out some of their recipes when I am willing to work on my knife skills. I don’t like to cook, and technically this isn’t cooking! The book also answered one of my great unanswered questions: What are those weird seeds available at the exit of my local Indian restaurant? The answer: Fennel seeds! Author Erica Palmcrantz was kind enough to take the time to answer a few more of my questions about the raw food lifestyle. Our interview appears below. 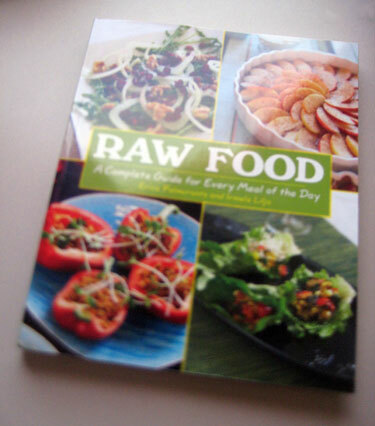 You can buy Raw Food: A Complete Guide to Every Meal of the Day on Amazon.com. I’m not a big fan of chopping fruits and vegetables. Are there any kitchen gadgets you can recommend that help quicken food preparation? A mixer and a food processor are very usable and make the raw food preparation very fun. If you have this there will be very little chopping. How can I work on my knife skills to become a faster chopper? I think if you put more attention in your chopping and think how wonderful it is to prepare the amazing food, then you will be less bored when you chop. While I love to eat, I don’t love preparing food. Is it possible to prep a lot of raw ingredients at once over the weekend to be used during the week? Food prepared à la minute is always the best but it is better to prepare in advanced than not doing it at all! Snacks, nutmilk and dressings you can always store in the fridge for a couple of days. Is there a way to preserve chopped vegetables in the fridge so they don’t lose nutrients and flavor? Put the vegetables in a sealed container or a plastic bag if you pre chop them. Does the raw food lifestyle simply require that you spend time each day on food preparation? When you get more use to making raw food you will see that your daily preparation of food is like a meditation and you want to spend time on food preparation because it gives you so much energy back. 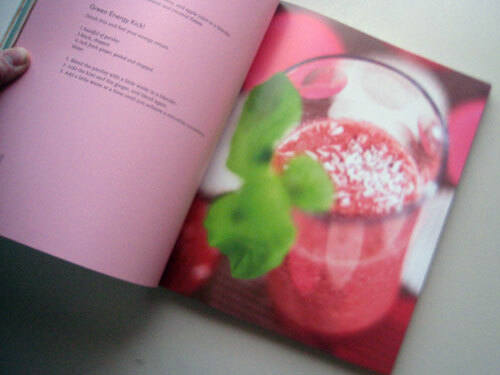 In the book, you specify that raw food is any food that hasn’t been heated about 104 degrees. What happens to food at 104 degrees that makes it lose nutritional value? You have something called living enzymes that over 104 degrees will looe is “aliveness” and 60-80% of all the nutrients will be lost in the heating process. Similarly, how does freezing food affect its nutritional value? Freezing is a good option, even thought it will lose some of its nutrients and this is also for the living enzymes. It is very much depending of the freezing process, if you pick your berries yourself and hurry to freeze them or if you buy freeze dried fruit and veggies. In the book you recommend that you start the day with a glass of water with lemon in it. Is there a particular reason for that, or is it just a way to ensure you remain hydrated during the day? After sleep it is important to give your body water to keep you hydrated and the lemon will do your body more alkaline and give your immune system a boost. – you recharge your body for a amazing day. Also by drinking water you will prepare your stomach and inner organs, by telling “food is coming soon”! 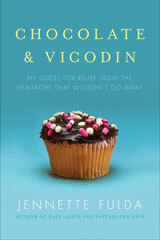 Your book shares many success stories about people who eat raw food and feel much better for it. Are there any people with medical issues that should be warned that they may not be able to adapt to a 100% raw diet? If someone has a bad reaction to going 100% raw, are they usually able to do at least 90% or 80% raw? I talk about going raw your way. You shouldn’t do things that a doctor not recommend or do something that doesn’t feel good in your body. Always listen to yourself and your reactions. By sustaining a 80 % raw food diet you can see a big difference in your energy and vitality. Is it harder to eat a variety of raw food in the winter when there aren’t as many fruits and vegetables in season? Yes, to get sun-ripened fruit and vegetables that are grown locally are hard to find, you can either increase your food with the food that actually are organic and locally grown such as, root fruits, kale and cabbage. Normally you also eat more nuts, seeds and dried fruits during winter time. You can always sprout and this will give you a lot of energy. Even superfoods that are high in nutrients can be consumed under the cold periods. Thanks again for you time, and thanks for the beautiful book! Thank you – may your journey in life be happy and joyful! Go raw – your way. I don’t mean to be malicious, but the raw-food fad is my definition of orthorexia. When “two hours a day of food prep” becomes a meditation? Far easier (and more social) to go for a walk and eat more. I do try to do my cooking in batches, while watching tv or something else, but 20 years of “good knife skills” have taught me the value of buying foods frozen, pre-sliced mushrooms, pre-cleaned garlic, pre-grated cheese. Eating raw foods is a great way to get extra nutrients and enzymes which are so beneficial to the body. I make it a point to eat one raw veggie and one raw fruit a day at least. Once I tried to go fully raw and I was miserable. Interesting review. I do think the prep for a raw foods lifestyle is WAY too time consuming for the average person though. Cute and interesting. I love your interview. This does seem very hand wavy ‘science’ to an actual scientist like me. I dont think I’ll ever go raw, but some of the recipes appeal since they are so fresh and delicious sounding. The two comments that particularly riled me were that lemon is alkaline (it contains citric acid, so I’m sure it must be around pH5) and that there are ‘living enzymes’, without any description of what the enzymes are. I would imagine our bile acids in our stomach would hopefully kill any of those! I like cake too much!! Love the review and the photos but I agree with the commenters who think two hours of food prep a day is WAY too much. Give me a break! I have a job and children and a house to keep in order; if I spent two hours a day “meditating” over my food prep I’d have no time for anything else. I believe raw fruits and veggies have a place in our diets but one doesn’t need to go all-raw in order to reap their benefits. JEM, me too. I try to eat raw as often as I can, and it requires little to no prep since all I have to do is grab an apple or make a small salad for myself. I don’t buy into all of the mystical, magical, pseudosciency benefits of raw food, but I do love to eat raw when I can. I doubt I’ll ever go fully raw, but I will say that being more aware of the benefits of raw food has inspired me to eat a healthier and more balanced diet, e.g., I will grab a piece of fruit or chop up a cucumber or pepper for a snack when I actively remind myself to integrate raw into my diet. Many people may find eating fruit and veg instead of chips or candy to be an obvious decision, but when someone is used to the standard American diet or tends to skip the produce aisle at the grocery store, she may need something to make her cognizant of her food choices and even of basic nutrition and nourishment. And thanks for the review, Jennette! Very timely for me. @Jenny – Some foods produce acid in the body, others alkaline. Lemons are an acicic food but in the body it alkalizes. I saw a show that had a woman doing the raw diet on it. She basically threw 100 unrecognizable foods into a blender and had a smoothy. Interesting review, but the claim that lemon juice is alkaline is completely wrong (it is on the acidic end of the pH scale). Also, enzymes are not “alive.” In general, an enzyme can be described as a catalyst for biological pathways occuring in the living organism. During the process of digestion, these enzymes are broken down into their component amino acids. Calling them “living” or “dead” is irrelevant to the digestive process as our body recycles them into the building blocks of future proteins. Um, I didn’t see it mentioned in your blog or in anyone’s comments, but am I to assume that the raw food diet is fully vegetarian? Any steak tartar in there, or sushimi? Or is it just all fruits and vegetables and (raw) grainy things? If it is mainly vegetarian, then I would think that that is the main change to a ‘normal’ diet, rather than switching from cooked veges to raw ones. And the fact that you are clearly not allowed any junk food, of course, as chips, donuts, biscuits, lollies/sweets … all cooked. The rawness of what you are left with seems a minor consideration. I think this would be hard for me. As dumb as it is, I have a hard time cooking just for myself (well, it would be preparing food in this case, since it’s raw). Some days I will make the effort – made kung pao shrimp with brown rice two nights ago. Other nights I just forage for a random mishmash of what’s on hand and ready. I did go to a raw food class once at the local supermarket. It was interesting. I did like the carrot and cashew soup we had. One thing I do a lot is smoothies – just 100%, no sugar added juice and frozen fruits. Healthy and filling. I’m also going to be doing a lot of gardening this summer, so that should help. When I was working at a garden, I would sometimes have a breakfast of freshly picked peas and little yellow pear tomatoes. It was delicious. I’ll see if the library has this book. The pics do look fab. Ya know, Jennette, I am relatively new around here and I haven’t seen any mention of a life partner yet, so forgive me if I am completely out of line. That said, as I was reading this piece, a thought occurred to me, just in case you don’t have a life partner. I had a friend once who found her life partner by working in a bookstore. She selected (and flirted with) dating material based on the books the potential datees bought. It was a lovely way to get paid for cruising. All of this is leads me to an idea: You don’t like the food prep, but repeated your posts reveal that you love when it’s been prepped. YOU perhaps need to be working at a Williams Sonoma. Just sayin’. What a load of hoo-hah. It’s orthorexia, as mentioned above. Interesting – I wonder how much of the increased energy is because of the raw diet vs just eating healthy in general? @Natalie – Some proponents of raw food absolutely do eat things like carpaccio, sashimi, raw dairy products, and raw eggs. If someone goes from a relatively poor diet to any kind of healthier diet, I think most often s/he will feel better. A diet doesn’t have to be 100% raw, vegan, vegetarian, gluten-free, or what have you to improve a person’s quality of life and overall health. I’m not big on the pseudosciency-ness of it either- I’m a big science geek, and it seems to me that most of their (raw foodies) claims are overblown or erroneous….. BUT…. My 80 year old grandmother is a raw foodie, and has not been to the doctor in…. oh, 30 years? She’s 50,000,000,000x healthier than I could ever dream of being. The lady doesn’t even own a stove. Just a hot-plate, and a dehydrator. Seriously, it’s awe inspiring. I would put WAY less stock in it if I did not know someone who directly benefited from the raw-food lifestyle, but I do- so it would appear that there are *some* benefits to it. I NEED to eat apples- so I MUST cook. Also, I love cheese just too damned much. and… pasta, eggs, steamed rice, roasted potatoes… I can’t imagine going without every one of my favorite foods. Life might be longer but would it be worth living? Anyway, I do love raw foods, and eat a lot of them- but I’ve never thought self denial was a good way to function. It’s all about moderation. careful of that mandoline, it cost me way more than $25 to get stitches after I had an accident with mine, though it took a dive during the earthquake, and needs a new blade now, so it’s resting for the moment. Orthorexia, and meditating on food prep, indeed. Also, I didn’t know lúcuma was a superfood as one reader mentioned. It’s just standard birthday cake and ice cream fare here (Chile). Tasty, sure. But a superfood? I’ll have to look into eating more cake and ice cream. I am pregnant with my 3rd child right now, and I asked my midwife what she thought of a 100% raw food diet. 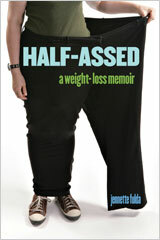 She said she’s seen so many women on a raw diet who had pregnancy complications that she would not recommend it. Food for thought for women of childbearing age….